Arthroscopy has become the mainstay of most surgeries involving joint evaluation in human medicine and has grown in popularity in veterinary medicine. Arthroscopy can be thought of as the pinnacle of minimally invasive surgery; prior to its usage, the open arthrotomy was used for joint evaluation. There are numerous advantages to minimally invasive surgery when compared to an open procedure in dogs. Arthroscopy can be utilized in cats, however due to size limitations, this is not always possible. In veterinary medicine, the use of arthroscopy has caught momentum over the last one to two decades and can be thought of as the “gold standard” when it comes to joint evaluation and treatment. The main joints accessible for arthroscopy are the elbow, shoulder, and stifle. The carpus, tarsus, and coxofemoral (hip) can also be evaluated in this fashion. The size of the patient can vary as well, from the 5 kg Poodle to the 90 kg Mastiff. Following arthroscopy, if a CrCL is diagnosed a stabilizing procedure such as a tibial plateau leveling osteotomy (TPLO) or tibial tuberosity advancement (TTA) can be performed at the same sitting. In cases where a CrCL tear is not diagnosed, biopsies and cultures can be obtained minimally invasively. Video 1. Video of a dog with a caudal cruciate ligament tear. The video shows an intact cranial cruciate ligament and it’s evaluation. 2. The elbow joint is the second most common joint evaluated arthroscopically. The main disease process we encounter in the elbow is called elbow dysplasia (Figure 1), which commonly affects large breed dogs and is a congenital issue, however elbow dysplasia can affect canines of all sizes. Elbow arthroscopy (Figure 2 and 3) has become the mainstay of diagnosis and treatment for this disease. Figure 1. Elbow dysplasia in a dog. Note the cartilage wear (medial compartment disease). Figure 2. Fragmented coronoid process in a dog. 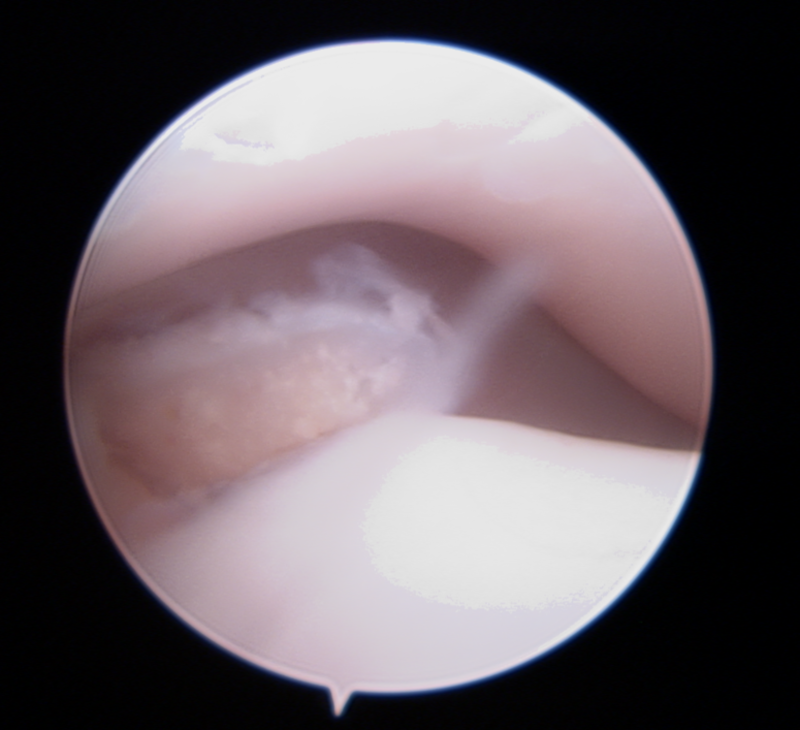 Arthroscopy of the elbow allows excellent evaluation of the cartilage and bone structures within the joint so we can see how extensive the “damage” (cartilage wear) really is. While radiographs and CT scans can provide us the information to know an arthroscopy is needed, there is no better assessment of cartilage wear and arthritic development than direct visualization provided by arthroscopy. 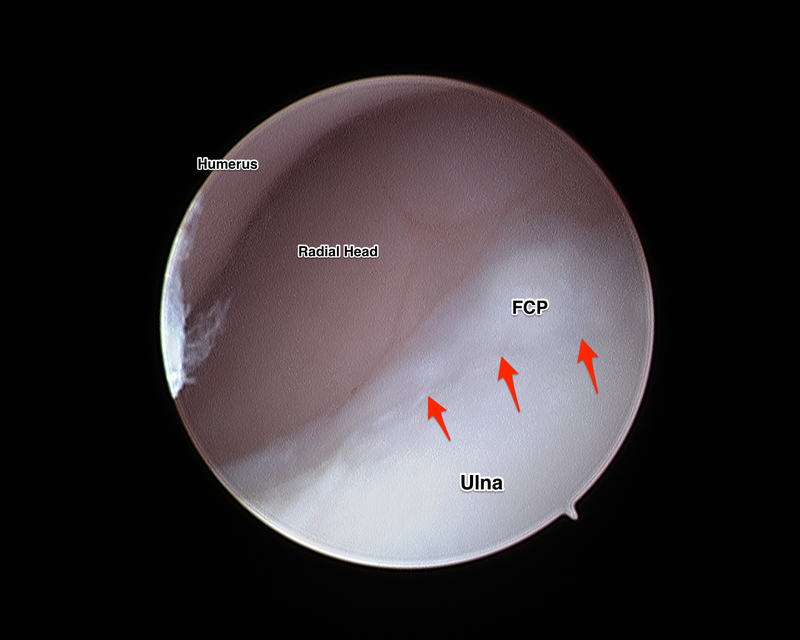 Other procedures such as subtotal coronoidectomy, removal of a fragmented coronoid process (FCP), and biceps tendon release can be performed through 3-4 mm instrument portals while performing the arthroscopy. Arthroscopy can also be used to evaluate the candidacy of these patients for other procedures such as a sliding humeral osteotomy or proximal abducting ulnar osteotomy. Figure 3. Elbow dysplasia in a dog that presented for front leg lameness. Note the fragmented coronoid process (FCP) (red arrows). The shoulder joint is another joint we commonly evaluate. We see predominantly ligamentous injuries in adult canines and cartilage lesions called osteochondritis dissecans (OCD) in juvenile large breed dogs (Figure 4). 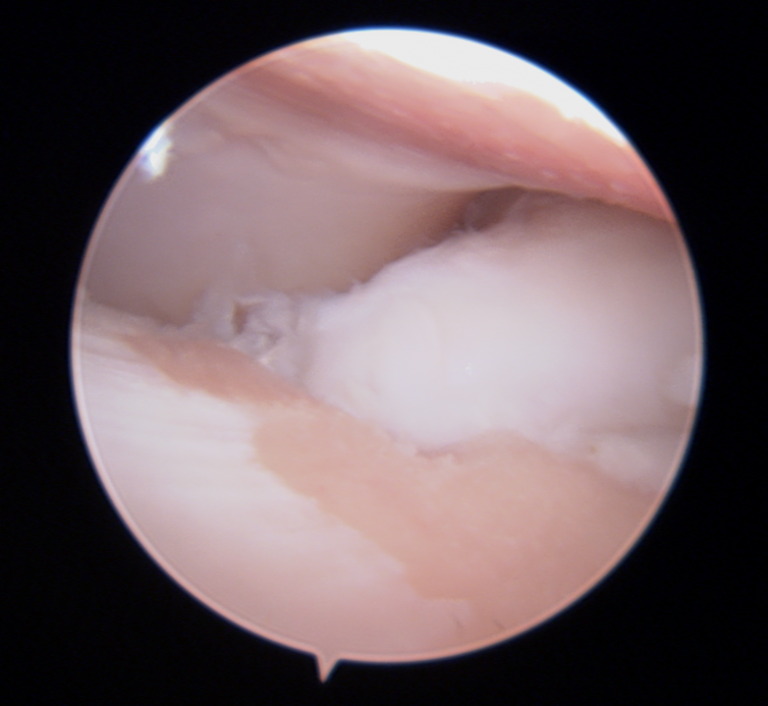 Arthroscopy is the ideal way to assess the ligament structures and the joint surfaces. This approach allows for minimal tissue morbidity and decreased recovery time compared to open approaches to the shoulder joint. Figure 4. Osteochondritis dissecans (OCD) lesion of the shoulder of a dog. Other joints that can be approached using arthroscopy are the carpus, tarsus, and coxofemoral joint. While these sites are uncommon, arthroscopy in conjunction with extra-articular stabilization can be used to provide the most advanced care for our patients. There are many advantages to arthroscopic procedures and the most notable is the ability to perform procedures that once came with a high degree of tissue morbidity with far decreased collateral tissue damage. Due to decreased tissue morbidity, recovery time is reduced in most cases. This improved comfort also allows us to start rehabilitation programs sooner to improve the overall outcome more quickly. The same switch to less invasive techniques have been made in human medicine with positive results. Another potential benefit of minimally invasive surgery is improved function during early and later recovery. Post-operative pain response is typically decreased with these techniques as the joint capsule has robust innervation and full incisions are avoided with these procedures. Also, post-operative infection risk is much lower in dogs with arthroscopy techniques versus an open arthrotomy. When evaluating a patient’s surgical needs, one must always weigh the associated risks and potential benefits to the individual patient. Every minimally invasive surgical procedure has risks such as anesthetic risks, wound healing, infection, and risk of converting to an open procedure. The use of minimally invasive surgery and arthroscopy, however, equips us to provide the most advanced techniques and care to our patients. Importantly, we also gain the opportunity to facilitate a faster and more complete recovery.